I have three that all are simple, basic sleds. The one in the photo below can handle boards over 27” wide, I also have ones for boards up to 12” and 18”, so I don’t have to mess around with sleds larger than I need. Build one. If you don’t like it, you will learn a lot which will help you build – or buy – a better one next time. 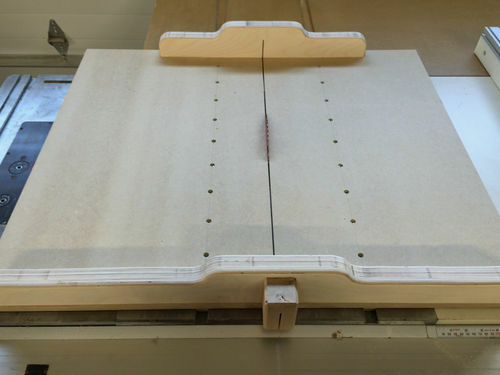 And for your first crosscut sled, it’s not likely that you will need all the fancy features that are available. Avoid analysis paralysis, go with a “minimal” design, build it and use it. Size: Mine is about 15” deep and probably 36” wide, with most of the mass to the right of the blade. The rails are about 3” high. FWIW, I started with a largish scrap of ply I already had, ripped two 3” strips lengthwise, glued and screwed the back runner on (NOT critical to be square, it’s just for stability). Glue and screw ONE miter slot runner on (still, NOT critical to be square! ), set the sled on the saw, and attach the second miter slot. Now raise the blade the thickness of the ply, and push the sled through once. Now anchor one end of the front rail (this one will have to be square!) and use a framing square to get it nearly square to the blade. From here you can use a variety of methods and your own ingenuity to position it permanently, perfectly square to the blade. Definitely build your own IMO. Size depends on your needs. I don’t see the point of making one smaller then 12” deep. But I also have one that is over 32” deep. Just depends on what you plan to use it for. I would NOT make just a big one. Bigger is more awkward and they start to get a bit heavy. Big is great when you need it, but something smaller is easier to throw around for the common small stuff. Also, unless you know you’re going to be doing a lot of miter cuts. I’d keep it simple as shown by Rich in the above photo. And unless time is money for you, I’d build one. Build, as said before don’t go to big unless you have a purpose for it! My sled overhangs the left side of my TS by about 2”. On the underside there, I have a stop block fastened to the sled and there is a stop block mounted on the edge of the saw table. When my cut is finished, the stop blocks hit together stopping my sled from moving any farther forward. On the sled there is also an overhang to cover the blade as it enters the final inches of the cut. The blade stays covered. I also built the back cross piece high enough that my fingers are safely away. Just some ideas to consider if you should build your own. Like clin said, size is depend on what work you do with it. Crosscut and more. This is a Nick Ferry designed sled. Obviously big, but thats what I wanted. Miter attachment and a tenon jig as well. I built mine the exact size as my table, not including the wings. 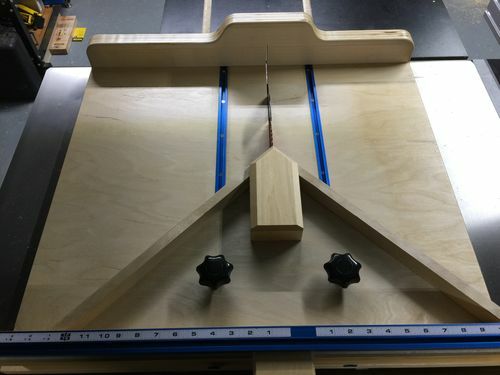 If you have your table aligned with the blade perfectly it will make it easy to build your sled. Who is selling ready made ones? Rockler, Incra, and I’m sure more.